October is here and we’re ready to bring out our favorite fall décor, outfits and take part in fun seasonal activities! October is a special time of the year because we can sit and watch the seasons slowly change from a warm summer to a cool crisp fall. There is just something about seeing the leaves change color and hear them crunch as we step over them in our over-the-knee boots. With this change comes a change in some of our daily routines as well. Check out our favorite October product, trends and activities below to try out this month that will give you all the fall feels. 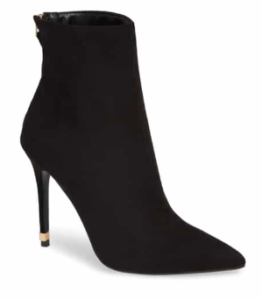 Sweaters, leather jackets, over-the-knee boots – we love all fall fashion staples! During the month of October, you may find that it is still warm enough to incorporate some of your summer staples into your styling by simply adding a few extra layers for the cooler times of the day (you can check out our best transitional pieces blog post for more layering inspo). We are loving the BLANKNYC Morning Suede Moto Jacket ($188) and Topshop Ella Heeled Bootie ($75) which pair perfectly with a skirt or dress during the warmer days of the month. The PSL can be a bit of a toss-up – people tend to either really love them or really hate them. Luckily, many brands of all industries hop onto the pumpkin spice trend and release items in this special fall flavor. You can, of course, treat yourself to a Pumpkin Spiced Latte from Starbucks or your local coffee shop for a special autumnal drink as they are usually only on the menu for a limited time. For those who aren’t in favor of the popular drink, we happen to love products like Sur La Table’s Pumpkin Spice Soy Candle ($18) which is great for adding an amazing scent to the room when you have guests over. 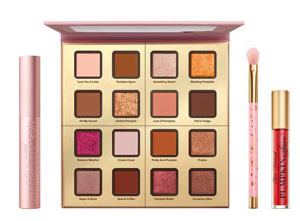 Those looking to add a little oomph to their beauty routines can treat themselves to Too Faced’s new Pumpkin Spice Eye Palette Collection ($49) with lots of goldeny-auburn shades. Try using lighter shades for a cute and casual look for work that you can easily add darker tones to when heading out for a night of fun. 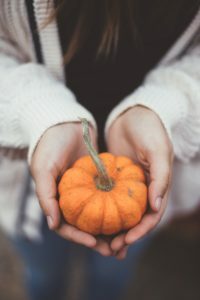 October can be a very busy month between exams for students or trying to get quarterly work projects done on time, so it is important to dedicate time to treat yourself to a little self-love. We love pampering ourselves to a manicure or pedicure after a long day and love to incorporate a seasonal color into our look. 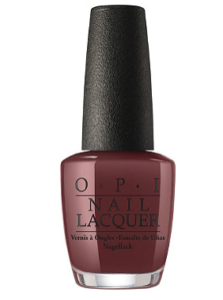 Next time you head to the nail salon, try a darker shade like Essie’s navy Midnight Cami ($9) or OPI’s That’s What Friends Are Thor ($10.50). These fun colors will add the finishing touch to your fall outfits by adding an autumnal look. We love taking part in fun fall activities to get us into the October mood. Try stopping by the nearest pumpkin picking patch and get creative with fun holiday carving with your girlfriends. There are so many fun ways to decorate a pumpkin to use all month like like this cute carved pumpkin punch bowl for entertaining. We also love wine tasting or apple picking as great ways to spend time with friends – plus you’ll get to take part in tasting some fun treats along the way with plenty of Instagrammable backdrops! Be sure to try out some of these October products and ideas and tag @mariposacomm on Instagram so that we can see how you did!